Use the Space/Calendar Request form on this website to make contact initially. Then coordinate with Silvia Lucatero, Community and Parish Programs Assistant, silvia@smitv.org, about a key or other access to the building as well as equipment and furnishings. Being aware of the condition of the space upon entering and committing to leaving it in as good or better condition is the general principle. No staff are available to set up or cleanup; each group takes on responsibility for these activities. 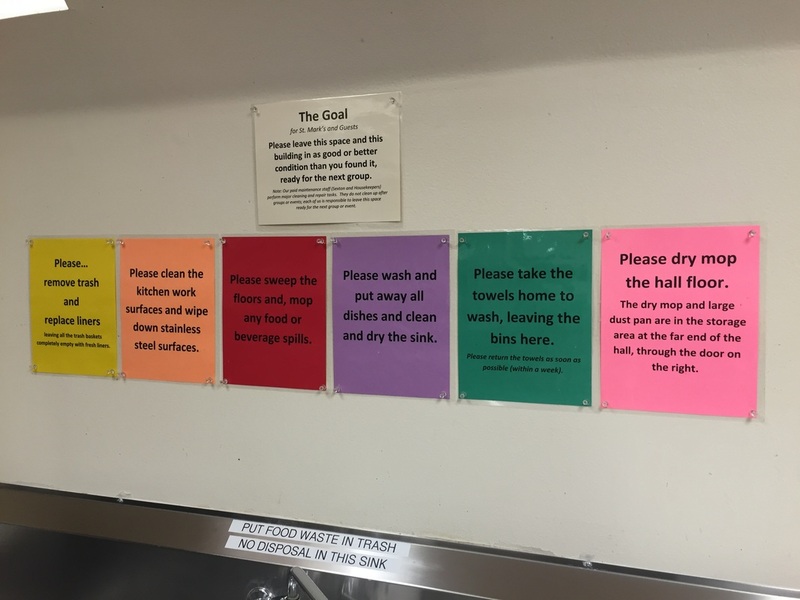 Signage in the kitchen and other Stacy Hall areas will help guide your use of the space – please pay attention to it. Remove trash/recycling and replace the liners right away. Liners are on the large table in the Stacy Hall kitchen and in a marked drawer in the Parlor kitchen. Trash/recycling goes in the enclosure (unlocked) behind the Stacy Hall kitchen door on the driveway. Clean the kitchen work surfaces and wipe down stainless steel. Sweep the kitchen floor and wet mop major food or beverage spills (no need to wet mop the whole space if there are no major spills). Wash and put away all dishes and clean and dry the sinks. Generally, do not leave food at St. Mark's. If you do leave food for a future event, it must be labeled with a contact name and the date the food will be used. You will find easy-to-follow instructions next to the Stacy Hall dishwasher. Take dirty towels home to wash (leaving the bins) and return the towels within a week. If you use any St. Mark’s table linens, please launder them according to the Women’s Guild guidelines (available in the kitchen pantry - take a copy with you) and return them within a week. Dry mop the floor in the hall (dry mop and dust pan are in the storage area at the far end of Stacy Hall, the door on the right). Leave the room organized and ready for the next group; put furniture back where it was when you came in. Follow the instructions for storing chairs and tables in the storage room; note that we have three colors of chairs that we use separately at times – store them separately as indicated. In the Parlor, do not stack furniture against the cabinet doors. If you use the preschool play area, please use the equipment and toys with respect and leave them organized and in good condition. Do not open any closed or locked storage areas. Children and youth (under 18) need active supervision by adults both in St. Mark’s buildings and on our grounds. The safety of young people is a key priority at St. Mark’s and adult attention and guidance at all times assures that children are going to have a safe and healthy experience while they are here. Leaders of groups convey the information in these guidelines to members of their group. It is generally fine to serve refreshments for your group and to use the kitchens. Refreshments require a higher level of attention to cleaning. Do not leave any food at St. Mark’s. Take home or give leftovers to your group members. Food left in the kitchens for a particular person or future event must be labeled with a contact name and use date. If you choose to serve wine and beer, please plan to also serve an equally attractive non-alcoholic option (not just water). We advise using great caution in choosing to serve "hard" liquor. Remember, you and your group/organization are responsible for your group members/participants getting home safely and without injuring others on the road. We are located in a residential area and, being a good neighbor, we want to make sure the noise from our campus does not disrupt our neighbors. Noise levels must be non-disruptive for the neighborhood at all times and at 10 pm Los Olivos is quiet for the night - all amplified music must end no later than 10 pm sharp. All deliveries must be coordinated with our Programs Assistant. Deliveries must be close in time to the event setup time scheduled and pickups right after. All unloading and loading must take place from the Stacy Hall driveway to not interfere with other campus activity and other events and meetings. St. Mark's is not responsible for any rental items left behind after an event or for checking on rental equipment. In accordance with state regulations, there is no access to Stacy Hall or the play area during preschool classes, 8:30 am-2:15 pm weekdays as scheduled. Consult the parish calendar (smitv.org) to determine days the preschool is in session. Two troublesome items are tape and decorations. Never use permanent tape or adhesives of any type. Many excellent removable adhesives are easily available (office supply stores) and are fine to use and then remove. When you remove decorations, do so completely, removing fasteners completely with the decorations. If your group meets in Stacy Hall or the Parlor, please plan to turn off the lights and lock the doors when you are done. Please be sure the lights on dimmers are off, not just turned low (turn knobs entirely to the left and push sliders all the way down). In the parlor, turn off the switch, don’t just lower the slider. Someone is assigned each evening to lock the church building; please leave it open with lights on in the evening, unless you are the group or individual designated to close. St. Mark's is not responsible for items left behind by your group. We typically donate lost and found items to People Helping People thrift store. St. Mark’s must have the name, cell phone number and email of two contact persons for reminders and especially in case of an unforeseen building or schedule problem. Take a long look around and see how things look. Is the space ready for the next group or individual to walk in and enjoy their time at St. Mark’s? If so, then you’re ready to go. Avoid scheduling conflicts; the parish calendar is on www.smitv.org. Please consult it regularly. Confirm that your event or meeting is listed correctly. To keep current on events at St. Mark’s, you can sign up for our weekly email newsletter on our website. On rare occasion, to accommodate unforeseen events (such as a funeral or an urgent community meeting) a schedule or assigned space will need to be adjusted. We find that in working together and in being adaptable, most events can be accommodated to serve all who need St. Mark's.